The outdoor pool in-room kitchens and complementary Wi-Fi breakfast and cocktails stand at attention at the non-smoking Homewood Suites by Hilton San Diego Mission Valley/Zoo. All 118 rooms at the mid-rise Homewood Suites feature full kitchens sofa beds mp3 docks free Wi-Fi and 49-inch flat-panel TVs with HDMI connections and speakerphones. Refuel over complimentary breakfast buffet goodies each morning. Dinner and drinks are also provided compliments of the house during select weekday evenings. 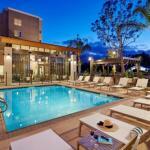 Stay busy in the fitness and business centers and unwind year-round in the heated outdoor pool. Extra perks include a gift shop and 24-hour front desk services. Pets are allowed for an additional fee. Situated off I-8 in San Diego's Mission Valley District the Homewood Suites places guests within four miles east of Old Town and the University of San Diego. Balboa Park a 10-minute drive south is home to the San Diego Zoo. Guests are also less than seven miles from SeaWorld and 32 miles south of Legoland. San Diego International Airport is seven miles from the hotel.